In Scene is a group exhibition of eight artists who work in a variety of mediums such as video, installation, sculpture and photograms in order to explore the state of the natural world in modern times. The exhibition is on view 10 AM – 4 PM, Monday through Saturday until Saturday, June 11, 2016. 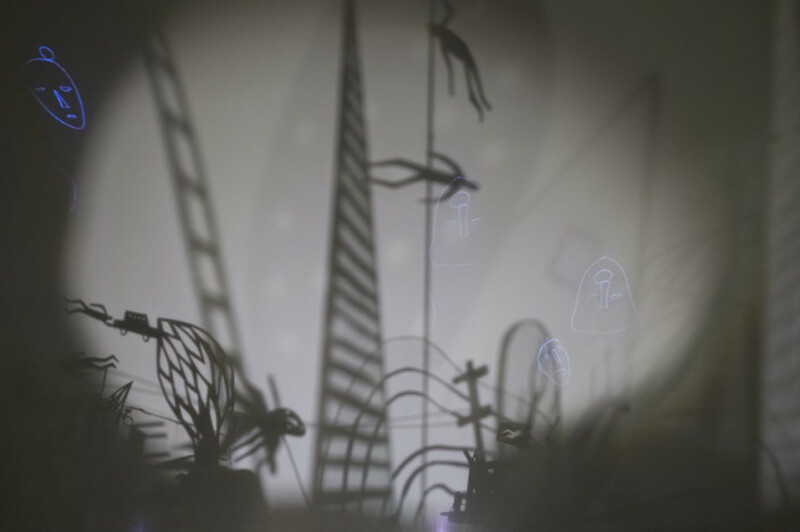 In Scene participating artist Laura Heit, who is being co-presented by the Schneider Museum of Art and the Ashland Independent Film Festival, presents her installation Two Ways Down, a hand drawn animated installation and film which takes inspiration from the Hieronymus Bosch work Garden of Heavenly Delights. In Scene also features installation, multimedia, and video works from internationally exhibited and recognized artists such as Rashawn Griffin, Adam Bateman, Jessie Sugarmann and MK Guth who is a grant recipient for the Schneider Museum of Art’s Artist Residency program, funded by The Ford Family Foundation, Roseberg, OR. Eugene based artist, Tannaz Farsi will present an installation outside of the Museum entitled Territory as the last participant in the Southern Oregon SITE Project that presents new art made in response to the “site” of the landscape, history and culture of the Rogue Valley. The collaborative team, Anna Daedalus and Kerry Davis will present Columbia River Water Shadows, a series of large-scale photograms made at ten sites along the Columbia River from the Hanford Reach to its mouth on the Oregon Coast. In Scene will be augmented with programs such as FREE Family Days and Tuesday Tours, drop in docent led tours of the exhibition held every Tuesday at noon. In Scene is on view through Saturday, June 11, 2016. Regular Museum hours are Monday through Saturday, 10:00 AM to 4:00 PM. The Schneider Museum of Art’s spring exhibition is generously supported by Rogue Frameworks, the Oregon Arts Commission, The Ford Family Foundation, Roseburg, OR, the Ashland Gallery Association, Bonneville Environmental Foundation, and the National Endowment for the Arts – Artworks program.